With the exception of the Guardian, most of the national media appear to have ignored this story, but the ruling on Tuesday by the Court of Appeal that the government’s mass digital surveillance regime is unlawful is highly significant. As reported on the Silicon website, this ruling is a major setback for the Government surveillance scheme, which had faced stiff opposition before it written into law in June 2016. It follows on from a ruling by the European court of justice in December 2016, which deemed Britain’s data surveillance laws illegal. The Investigatory Powers Act 2016, or Snooper’s Charter 2.0 as it is sometimes known, found itself in the dock after the human rights group Liberty (on behalf of Tom Watson and David Davis), launched a legal challenge to it in 2014. Davis later withdrew from the case after he entered government, in charge of Brexit negotiations. And now almost four years later, the Guardian reported that the court of appeals on Tuesday ruled that the powers in the Data Retention and Investigatory Powers Act 2014 (Dripa), which paved the way for the snooper’s charter legislation, did not restrict the accessing of confidential personal phone and web browsing records to investigations of serious crime. It thus allowed police and other public bodies to authorise their own access without adequate oversight. And this lack of adequate safeguards around accessing personal data was the main sticking point for the judges. The three judges reportedly said Dripa was “inconsistent with EU law” because of this lack of safeguards, including the absence of “prior review by a court or independent administrative authority”. The Liberal Democrats were at the forefront of opposing the legislation in this form in Parliament. They want a full overhaul of the system, one which puts protecting our freedoms and civil liberties at it's very core. We can be safe and secure by ensuring surveillance is targeted and suspicion-led if our police and intelligence services are given the resources and money they need to do their job. We do not need endless new laws. A leaked cabinet document containing the government's new analysis of the impact of Brexit has suggested that the UK would be worse off outside the European Union under every scenario modelled according to Buzzfeed. It is little wonder that the government have not published this document. It confirms all our worst fears about Brexit and underlines why the public need the final say on any deal. Every time I hear Donald Trump pronounce on climate change I think of Kenneth Welsh's Vice President Becker in the film The Day after Tomorrow, denying that anything is wrong even as a giant glacier descends on New York. We have not got to extreme scenarios like that yet, but the level of ignorance and failure to listen to the science and take appropriate action are on a par. Essentially, the facts are inconvenient and do not fit into a particular world vision or their ambitions for the United States, so they can be disregarded. People like Trump want to live for today without thinking about tomorrow. That may be fine for a businessman focussed on profit or feathering his own nest, but it is no way for a so-called world leader to behave. “There is a cooling, and there’s a heating. I mean, look, it used to not be climate change, it used to be global warming. That wasn’t working too well because it was getting too cold all over the place,” he said. Global warming and climate change are often used interchangeably, but in fact refer to slightly different things. The two are not mutually exclusive. “The ice caps were going to melt, they were going to be gone by now, but now they’re setting records. They’re at a record level,” Mr Trump continued. Mr Trump’s comments echo arguments often made by climate change sceptics that global warming has stopped, or even reversed, in recent years. Recent figures from the Met Office, Nasa and the US National Oceanic and Atmospheric Administration showed 2017 was one of the hottest years ever recorded. These temperatures came as little surprise to climate scientists, as they are a continuation of the upward temperature trend that has been on-going for decades. And Trump could not be more wrong about the ice caps. Data shows that they are indeed at “a record level”, but not the level Trump imagines. Last year Nasa reported record lows in sea ice extent in both the Arctic and the Antarctic. Is it little wonder we are hurtling towards disaster with this sort of leadership, a so-called World leader who is only prepared to negotiate on reducing emissions if it is a good deal for America? It brings to mind another film - 'we're doomed Captain Mainwaring'. Wales has made headlines across the UK today on not one, but two issues and they are both good news stories. It is a moment to savour. First and foremost of course is the remarkable performance from Newport County last night, who led Tottenham Hotspur for 82 minutes before succumbing to a late Harry Kane equaliser. The one-all draw was the least they deserved. A team that a few seasons ago were not even in the Football League, and who last season were struggling against relegation to the Conference, now face a replay at Wembley and a £700,000 windfall. The other good news story is the decision by the Welsh Government to give the vote to 16 and 17 year olds at local council elections. This has been long mooted and reflects a similar provision for that age group in Scotland. The arguments for this reform are many, including consistency of treatment (why should somebody who can leave school, seek full-time employment, be liable for tax and obtain a licence to drive a tractor not be be entrusted with the civic responsibility of voting? ), and widening political participation. You can find more reasons here. However, my concern is not with the thrust of this reform but its scope. Why stop at local elections? We know that the UK Government are not convinced of the case for widening the franchise but the Welsh Government clearly is and yet they have not sought to give 16 and 17 year olds the vote in Welsh Assembly elections. Given that the franchise for both council and Assembly elections are identical, it seems inconsistent and confusing to try and divide them in this way. If 16 and 17 year olds are competent enough to vote for a local councillor then surely they should be able to do so for a Welsh Assembly Member. My real concern is the effect this limited reform will have on motivations to vote. In my experience, 16 and 17 year olds are very rarely motivated by dog mess, broken pavements, the funding of social services and even the performance of local schools. They are slightly more motivated by the need for leisure facilities and public transport but don't always associate this with the council. So if this reform really is about extending the franchise, let's go the whole hog and allow 16 and 17 year olds to vote in Welsh Assembly elections as well. Reports in the Mirror that the Ministry of Justice has refused to publish an independent review it commissioned into prison maintenance early last year, millions of pounds of which was outsourced to Carillion, has underlined once more how unaccountable and opaque outsourcing contracts are. The paper says that the review was carried out after prisons minister Sam Gyimah said he was "not impressed" by Carillion's maintenance work in September 2016 and the firm was sent a formal warning. Despite that row, the firm went on to win another £40million in Ministry of Justice contracts in 2017, before collapsing leaving 20,000 jobs in the balance. This has obviously raised questions as to the process followed by the government and demands to see the review so that MPs can assess whether the Minister was misled or just incompetent. However, their request for the report, together with other reports on Carillion's effectiveness such as the "improvement plan", to be handed to the independent House of Commons Library have been refused because the material apparently contains commercially sensitive information. This has been a problem since the previous Labour Government fully embraced outsourcing the delivery of public services to private companies. Whereas before the House of Commons could effectively scrutinise problems and recommend improvements, now they find themselves blocked by claims of commercial confidentiality. This is also happening in local government on a smaller scale. We are getting to the point where outsourcing and privatisation are subverting the democratic process. Proper accountability is being undermined by the unavailability of key information. As a result, when something goes wrong as with Carillion, the lessons are not learned and nobody is held responsible. That is no way for a democracy to operate. The Cardiff Bay bubble is a curious place, full of secrets and rumours, whispering campaigns and personal vendettas. I suppose it is what you get when you lock away 60 politicians, their staff, dozens of lobbyists and a handful of journalists together for a couple of days and nights each week, cut them off from the real world and provide them with a platform to pursue their own agendas and prejudices. This strange game spills out into the bars and restaurants around the Assembly, except that it is no longer a game. Somebody has died and the players are turning in on themselves as others demand answers. Revelations have emerged of a toxic culture and bullying behaviour, and the furore right;y grows around the many unanswered questions about the circumstances which led to Carl Sergeant taking his own life. As a result of what happened, four separate inquiries have been set up and yesterday we learnt that the main investigation into how ex-Labour minister Carl Sargeant was sacked by First Minister Carwyn Jones is to be headed by Paul Bowen QC and is expected to last four months. The other inquiries are the inquest itself, one into whether the First Minister misled the Assembly when he said no allegations of bullying had been made to him in 2014 and a probe by the Permanent Secretary, which is looking into whether the news of Carl's sacking was leaked or not. In a statement on the separate leak inquiry, a Welsh Government spokesperson said: "This investigation has now finished and found that there is no evidence of prior unauthorised sharing of information by the Welsh Government relating to the recent ministerial reshuffle." This is strange because everybody within the bubble seemed to know that Carl Sergeant was to be sacked ahead of the official announcement. So the question now is, if there was no unauthorised leak, then who authorised it? The National Audit Office tells us something that I believe many already suspected, Liam Fox's International Trade department is not fit to secure post-Brexit deals. What was described as a “deeply worrying” report is published after Wilbur Ross, Donald Trump’s Commerce Secretary, placed further hurdles in the way of future trade talks by describing the US as a victim of a global trade war. The rest of the world should expect more tariff hikes from Washington in retaliation, he warned – after the US imposed tariffs of up to 50 per cent on imports of washing machines and solar panels from China and South Korea, Mr Ross said. “Trade wars are fought every single day,” Mr Ross, speaking at the World Economic Forum in Davos, said. “And, unfortunately, every single day there are also various parties violating the rules and trying to take unfair advantage. Last year, The Independent revealed that, when asked to list how many experienced trade professionals it employs, DIT – set up when Theresa May came to power, in 2016 – could list only one. Just months after the Brexit vote, Dr Fox accused British business of failing to prepare for the new trade deals he would negotiate and for becoming “too lazy and too fat” on previous successes. Now the watchdog has warned the department has “put back some of its delivery milestones as the timetable for legislation and the overall negotiation process has moved on”. It raised the alarm that the civil service model, which sees staff move every few years, is “not best suited” to developing specific trade and negotiation skills, with a “premium” on recruiting outside staff. “Considerable work will need to be done to build skills that have not existed in government for a generation,” the NAO said. So much for all those promises and reassurances on trade deals during the referendum campaign. Yet another example of how Brexit threatens our way of life has been revealed by the English health secretary. As the Independent reports, Jeremy Hunt has admitted that EU cancer drugs may not be available to British patients after Brexit, describing the risk as “uniquely damaging”. Drug giants have told of “significant disruption to the supply chain for medicines” and that customs delays would damage “time and temperature sensitive” materials, without a Brexit deal. “It is uniquely damaging to both parties if we don’t come to an agreement,” Mr Hunt told an inquiry by the Commons health committee. Mr Hunt said it was the issue’s importance that gave him “a lot of confidence that we will be able to agree what we need to agree”. The stance will alarm business leaders, who have warned they will be forced to implement plans to shift part of their operations out of the UK without an agreement by the end of March. This week, the CBI’s director general, Carolyn Fairbairn, pleaded with Theresa May to speed up the talks in order to deliver a transition deal within 70 days. Companies badly needed the clarity that the Brexit talks were not heading for the rocks, or they would begin to move jobs and investment offshore, she said. Failing to secure a deal would be an act of "great economic self-harm", imposing billions of pounds of costs on UK goods sold to and bought from the EU, Ms Fairbairn added. It is the uncertainty that is most damaging and the fact that the present crop of Ministers don't seem to know how to resolve it. When Donald Trump declared that he wanted to 'drain the swamp' he was referring to the Washington establishment who, he claimed, had been holding the USA back for too long. When the embattled UKIP leader, Henry Bolton says he wants to drain the swamp he means his own party, who are fighting hard to get rid of him. The contrast could not be sharper, UKIP has turned back in on itself. It no longer pretends to be concerned about the future of the United Kingdom. The party is too preoccupied with its own internal power struggles and with the fate of its leader, and a girlfriend who has been slated for her racist comments. Who would have thought that UKIP might attract racists to its ranks? As the Guardian reports, Henry Bolton's refusal to quit as UKIP leader and his hints that he may rekindle his romance with Jo Marney, has provoked mass resignations from the party’s senior team over his handling of the affair. The UKIP leader lost 10 portfolio holders on Monday, with spokespeople for work and pensions, culture, London, education, local government, trade, justice and environment, as well as the deputy leader and another assistant deputy leader quitting during the course of the day. That added to five resignations from the spokesmen for immigration, Brexit, sport, Treasury and disabilities over the last couple of weeks. And as if things could not get any worse, Nigel Farage chose that moment to stick his two-pennyworth in, saying it was right for Bolton to hold out for a vote of UKIP members, four months after being elected to the post. With five leaders in just over 15 months, surely it is time for the swamp to finally claim UKIP for its own. Very few people will mourn if the party sinks without trace. I have written here before about the need for a major government investment in social housing if we are to deal with rising waiting lists and also provide a stimulus to the economy. I am pleased to say that this approach has once more been endorsed by a cross-party committee of MPs. As the Guardian reports, the House of Commons Treasury Committee has urged the government to lift a cap on the amount of money councils can borrow to build homes. They believe that the Chancellor of the Exchequer did not go far enough when he used his autumn budget to increase the borrowing cap for councils in some areas to £1bn. They want the cap removed, or at least that it is made clearer which areas could seek the higher limit. They were also sceptical about Hammond’s most high-profile housing measure in the budget: the abolition of stamp duty for first-time buyers on the first £300,000 of any property costing up to £500,000, which the Office for Budget Responsibility (OBR) forecasts will help 3,500 extra buyers at a cost of £3bn. More than 217,000 new homes were built across the UK in the year to April 2017 – 15% more than in the previous year but well short of the government’s target of 300,000 a year. Nicky Morgan, the Conservative MP and former education secretary who chairs the Treasury committee, said the government was struggling to meet its aspirations on housing. “The chancellor pledged to fix the broken housing market, but the government is going to find it very difficult to meet this ambition. The increase in the cap on borrowing for local authorities to build homes is a step in the right direction, but it doesn’t go far enough,” she said. This is absolutely right. Without a local authority led building boom, we will never recover the ground necessary to meet the country's housing needs, whilst those who cannot afford to get on the housing ladder will be left without adequate and affordable accommodation. In a challenge to Eurosceptic cabinet ministers, Ms Fairbairn will argue that Britain should remain in a customs union with the EU until there is proof that new trade deals with the US and other countries will outweigh a potential loss of business with the bloc. She will also say that retaining a customs union with the EU would “go a long way towards solving the border problem in Ireland”, arguing that it is part of a “practical, real-world answer” to the problems thrown up by Brexit. “Remaining a member of a customs union for as long as it serves us to do so is consistent with the result of the [Brexit] referendum and would be good for EU firms too,” Ms Fairbairn will say in a speech at Warwick university. The mantra that we can stay in the single market whilst leaving the EU has become the focus of disagreement for Brexiteers and Remainers alike. Even those who do not want us to leave the EU have argued that remaining part of the single market is a compromise, which squares the circle of what is good for the UK with the expressed wish of the British people to have nothing more to do with our European neighbours. On the other side of the argument we have the unlikely pairing of Jeremy Corbyn and Theresa May, who have stated that it is not possible to both leave the EU and remain in the single market. To an extent they are right. The choice is actually very much a black and white one. If we are going to remain a member of the single market, paying into EU coffers so as to continue to have full access to financial markets, complete with free movement of goods, services and labour, then why leave the EU in the first place? At least by staying put we would have a say on the rules we are signing up to. The real debate is not about some grubby compromise over the single market, but whether we want to remain a meaningful member of a European Union, which forms our biggest overseas market, has brought thousands of jobs to these shores and has effectively contributed to over seventy years of peace on the continent. 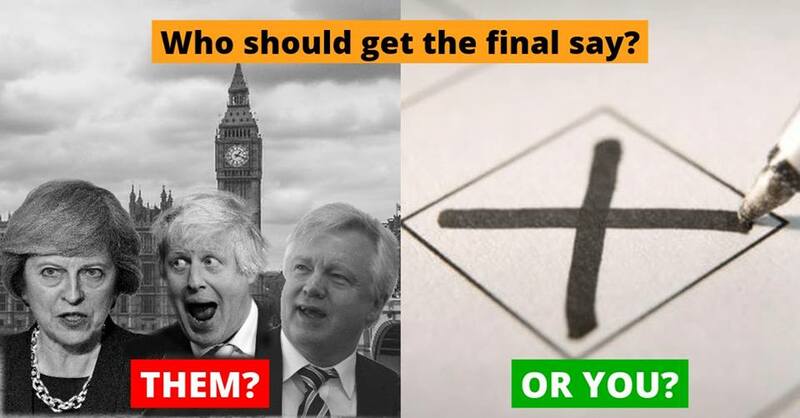 That is a choice that should be put to the British people once a deal has been struck for our exit. 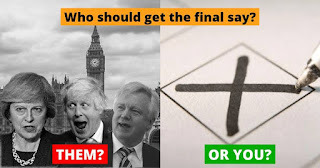 The final decision must rest with the electorate but it should be an informed choice with clear options, not the wishy-washy undefined future we voted on back in 2016. How are the DUP spending their windfall? According to i-News, the first tranche of the £1 billion secured by the DUP as part of its deal with the Tories is already being spent, despite the fact that Parliament has not authorised the expenditure as the Government said would be necessary. In other words there will not be a vote on the deal, but the money is likely to be bundled in with wider public spending authorisation in the Spring Supplementary Estimates, a tidying-up exercise which regularises public spending in the final few weeks of the financial year. This will make the job of scrutiny very difficult, minimise the chances of the opposition being able to focus in on the deal when debating the estimates and effectively undermine transparency. The fact that even a small part of the money will have been spent prior to the vote is a snub to the Parliamentary system. Promises made during the referendum campaign that it would be possible for the UK to have its cake and eat it by leaving the EU whilst at the same time accessing all the benefits of membership, were very swiftly disabused yesterday by the French President. During his visit to Sandhurst Military Training College, Emmanuel Macron rejected the idea of a tailored Brexit deal for the City, insisting Britain will not be allowed full access to European Union markets, including financial services, unless it pays into the EU budget and accepts all its rules. Financial services is one of the sectors in which France hopes to seize an increased share of the EU market after Brexit. City firms are concerned about new trade barriers, including the loss of so-called “passporting” rights, that allow them to operate throughout the EU from headquarters in London. This is the reality that the Brexiteers have refused to acknowledge. Losing full access to the single market for financial services will see hundreds of jobs decamping to the continent and an adverse impact on our balance of payments. If we have to pay in and accept the rules of the single market to counter that then the question arises of why leave in the first place. This is one more consideration that needs to be put to the electorate as part of a second referendum. The claim by Boris Johnson earlier this week, that Brexit can deliver even more than the widely debunked £350m a week to NHS was not just ludicrous, but completely misleading. As statisticians have said, the original claim ignores a rebate and EU funding of projects in this country. Tellingly, the Foreign Secretary is still referring to a gross figure to back up his new fantasy, once more ignoring the flow of money into the UK from Europe. I am not the only person who is sceptical about Boris' motives and his dubious assertions. Dr Wollaston, a former GP, said Mr Johnson “should stop using that figure”. She told BBC Five Live: “I feel it was entirely a deliberate deception [during the referendum campaign]. They knew that figure was incorrect but I had people repeatedly saying to me, ‘Well all that matters is that people remember a big number’. “I found that shocking and I think it’s absolutely shocking that there are people continuing to use it. She added: “[Mr Johnson] should stop using it. It’s a disgrace, and I feel very strongly about that. Ms Wollaston is absolutely right of course, but there is a wider point here around collective responsibility and the duty of Government Ministers not to mislead the public on key issues. It is fairly clear that Boris Johnson can now get away with virtually anything within the government. Theresa May appears to have no authority over him and lacks the ability to rein him in. However, there is a difference between campaigning as a backbench MP in a referendum campaign and making promises as a Minister. People will expect the UK Government to deliver on Boris' promise of an extra £350m a week for the NHS because as he is in the cabinet, he will be considered to have established all the facts before spouting off. The fact that the Prime Minister has not contradicted him adds authority to this alternative truth. If this government continues to mislead in this way they may come back down to reality with a very painful bump. For all intents and purposes, the struggle for control of the Labour Party was over once Momentum secured an effective majority on the party's National Executive Committee, however the real contest has just begun. In what one senior Labour figure called a “cold war arms race”, the GMB union has been encircling supportive MPs with newly affiliated branches, all of which would have a vote in any “trigger ballot” to reselect the sitting candidate. Decisions to affiliate branches are taken at regional level. Several MPs have also told the Guardian that Unite, whose leader Len McCluskey is a staunch supporter of Jeremy Corbyn, is actively signing up new, small-scale branches – although Unite denies the claims. This unspoken civil war is set to intensify over the next few years as local parties decide who will represent them at the next General Election. If the Corbyn project is to succeed then he needs to have MPs sympathetic to his point of view so as to elect his chosen successor. This is when things really do start to get interesting. One of the problems we face in trying to live more sustainably is that when managing waste we are starting too far down the hierarchy. Effectively there are a number of ways to reduce the amount of stuff we send to landfill and conserve resources which would otherwise be diverted into cosmetic packaging. At the top of that hierarchy is the need to prevent the waste in the first place by finding other ways of doing things. Below that is minimisation, reuse, recycling, energy recovery and disposal. Most government initiatives focus on getting people to recycle their waste, whilst the development of facilities to burn waste products to generate energy is also a popular option. I would suggest that a far more sustainable and useful role for Ministers would be in preventing and minimising the waste in the first place, especially when it comes to packaging. As ever it takes the private sector to lead the way, with the very welcome initiative from Iceland in seeking to become the first major retailer to commit to eliminating plastic packaging for all its own brand products within five years to help end the "scourge" of plastic pollution. As the Independent reports they plan to replace plastic with packaging that includes paper and pulp trays and paper bags, which would be recyclable through domestic waste collections or in-store recycling facilities. Surely it would not be beyond the bounds of possibility for others to follow suit or for government to consolidate initiatives they are already considering on reducing plastic by legislating to force through a revolution of this sort. I am positive that the hard-pressed householder would welcome assistance from Ministers in living sustainably, instead of having to bear the burden of recycling initiatives all by themselves. There is some controversy over recent changes to terms of payment which bans retailers, airlines and other businesses from hitting shoppers with hidden surcharges when they use credit or debit cards. These surcharges can be as high as 20 per cent and costs consumers around £166m each year. The downside is that retailers will now try to recover the cost by raising their prices and this will hit people who tend not to use credit cards for purchases. The reality of course is that as a society we are addicted to credit and that the vast majority of people will use credit cards for major purchases, not least because there is an insurance element attached to these transactions. So balance this is a development to be welcomed. Which of course is what the Prime Minister did. Green MEP Molly Scott Cato told The Independent: "In spite of her rhetoric about fairness Theresa May is failing to give credit where it is due in suggesting that it is her government that is banning credit card charges. "The truth is that it was my committee in the European Parliament that fought for and won the cap on credit card fees paid by many retailers which will mean lower charges for UK consumers. To achieve this we had to battle against national governments as well as the finance lobby. "It’s also clear that it was the power of 500 million consumers that enabled us to put pressure on the credit card companies. Brexit Britain will be much weaker and its consumers more vulnerable to financial rip-offs." Labour MEP Clare Moody also criticised the claims, addressing Ms May on Twitter: "No, you haven’t. This is an EU initiative from which all EU citizens will enjoy, not instigated by UK Government." Liberal Democrat leader Vince Cable said: “Once again the Tories are claiming a popular policy that they had nothing to do with." “These new rules will make things easier, cheaper and more efficient for consumers. Once again EU rules are helping people in their everyday lives. Unfortunately this doesn’t match Theresa May’s spin so instead the Tories are lying to the public. Perhaps Theresa May would like to reconsider her determination to take us out of the European Community after all. Should Norway just grin and bear it? I suppose that in a week in which the President of the United States has branded dozens of countries as 'shitholes', a minor spat between Norway and Australia can easily be ignored. And so it would be, if it wasn't so amusing. Of course Australia was actually referring to the Norwegian archipelago of Svalbard, better known by its Dutch name Spitsbergen, meaning "jagged mountains". These islands lie in the Arctic Ocean, north of mainland Europe, about midway between continental Norway and the North Pole. As Wikipedia records, the islands were first taken into use as a whaling base in the 17th and 18th centuries, after which they were abandoned. Coal mining started at the beginning of the 20th century, and several permanent communities were established. The Svalbard Treaty of 1920 recognizes Norwegian sovereignty, and the 1925 Svalbard Act made Svalbard a full part of the Kingdom of Norway. They also established Svalbard as a free economic zone and a demilitarized zone. So technically both countries are right. There are no live polar bears on the Norwegian mainland, but there are in Svalbard. 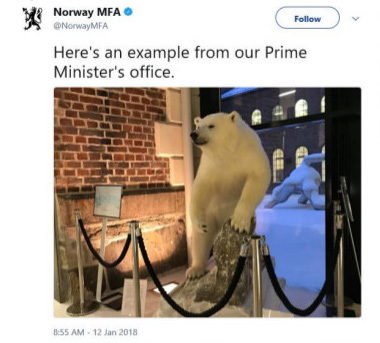 Still, the publicity will not have done Norway any harm. There are some who would suggest that his contribution and that of his party to the European Parliament does not justify the full £101,808 a year salary, but Nigel Farage and his fellow UKIP-refuseniks have been elected and they are accountable to their electorate not the likes of me and other pro-Europeans. However, as the Guardian reports, Farage has finally got his comeuppance after a European parliament investigation alleged he had misspent public funds intended for staffing his office. As a result, he has been docked half his monthly salary. UKIP have used the European Parliament as a means of funding their political activities for too long. This sanction is welcome. Is another referendum now more likely? The sudden conversion of Nigel Farage to the idea of a second referendum on whether we should leave the European Union or not, backed by the co-founder of the Leave campaign, Arron Banks, has certainly animated many Remainers. Even Sir Nick Clegg tweeted, 'I agree with Nigel'. Nigel Farage's rationalisation for his U-turn is that another Brexit vote would lead to a more decisive victory for the leave campaign and silence remain supporters for a generation. My view is that the result of a second plebiscite would be close, could go either way and could still leave the issue unresolved. Timing is also crucial. As the Guardian says, the natural time for a second EU referendum would be a poll on whether to accept any deal that May negotiates with Brussels before the date of Brexit in March 2019, or whether the UK should leave without an agreement if she fails to secure one. They suggest that if parliament were to vote against May’s deal with the EU, it could provoke another referendum on the issue or a general election in which Brexit was the central issue. Personally, I would prefer a referendum because General Elections are rarely decided on single issues and do not as a rule provide clear mandates for constitutional change. The most interesting part of this little bit of mischief making by Farage is the impact it will have on the Labour Party. The Guardian believes that growing support for another referendum could fuel divisions within Labour. The party leadership currently maintains that there is no need for another popular vote. That is a contrast to some of its pro-EU backbenchers. Farage has opened the door for a U-turn by Jeremy Corbyn. It is time he showed some leadership, acknowledged his role as an opposition party instead of propping up the Tories and came out for a confirmatory referendum that might give us the opportunity to stay in the EU. I admit to a level of scepticism earlier this week when I stumbled across a plaque fixed to the fence at the side of Swansea's Uplands Tavern, which boasted that Dylan Thomas and Kingsley Amis drank together in that pub. My first reaction was to ask whether the two had even been in Swansea at the same time, however a bit of googling soon verified the claim, though any suggestion that the drinking session was repeated is soon disabused by Amis himself. Thomas was already in the pub, a glass of light ale before him and a half-circle of students round him. The impression he made was of apathy as much as anything. Also in attendance was, I said in 1957, a Welsh painter of small eminence whom I called Griffiths. In fact this person was a Welsh poet of small eminence by the name of John Ormond Thomas and later known professionally, I understand, as John Ormond. In the course of the session he told us several times that he had that day driven down from his house in Merionethshire (north Wales, now part of Gwynedd) on purpose to see Thomas, whom he had known, he said more than once, for several years. Thomas seemed very sedate, nothing like the great pub performer of legend. He was putting the light ales down regularly but without hurry. It is possible to feel Dylan's presence wherever you go in Swansea (and of course where he lived in West Wales), but not every establishment he patronised sees fit to record the fact. 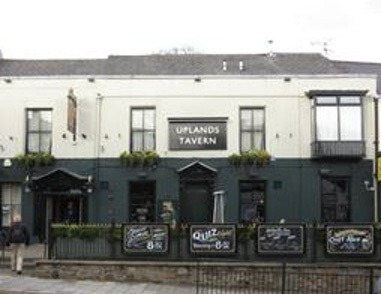 Kudos to the Uplands Tavern then, for doing so and causing me to find the account of this incident online. Are UKIP the most dysfunctional Welsh Assembly group ever? Having secured the election of seven Assembly Members in 2016 it did not take long for UKIP to start falling apart. Right at the beginning of the session there was a coup during which Neil Hamilton ousted the party's Welsh leader from fronting up the group. Nathan Gill subsequently left the UKIP group and sat as an Independent before he decided that he would rather concentrate on being an MEP and resigned from the Assembly altogether. There are many who say that he will not be missed due to his erratic and infrequent appearances in the Senedd. And then the now six-strong UKIP group lost a second member as Mark Reckless defected back to the Conservatives. So it must have been a relief to the remaining five members when Nathan Gill's resignation saw his replacement by another UKIP member. A fresh start? One would think so, alas it was not to be. As the Western Mail report, Mandy Jones, the new North Wales UKIP AM, lasted just hours as a member of her party's Assembly group. Instead of welcoming her with open arms, Neil Hamilton and his little fan club put out a statement claiming that Ms Jones had chosen to employ people who “are either members of, or have recently campaigned actively for, other parties, or both” and that as such she was not welcome to join them. She said she was “shocked, upset and appalled” to be told that she should dismiss the staff members previously employed by Mr Gill. A former shepherd and the mother of four grown-up children, Ms Jones, who lives near Corwen, said: “Nathan Gill contacted me a while ago and told me that he intended to resign his seat and that under Assembly rules I would take over. “I then had a dinner in north Wales with Neil and Christine Hamilton. They were charming, but it was mentioned to me that I shouldn’t reappoint Nathan’s staff and that they would help me to get staff of my own. “I was very conscious of the fact that I needed people to help me through the transition. Assembly officials told me that Nathan’s staff members had a good work ethic. I was happy to take them on to help me. Otherwise I would have been totally unsupported. “I couldn’t believe it when I was given an ultimatum. Before the group meeting on Monday evening the other Ukip AMs were all friendly towards me, so I wasn’t prepared for the nastiness. I didn’t sack the staff in line with the ultimatum, but I only found out they had excluded me from the group during a meeting with the Presiding Officer Elin Jones when I was shown the statement. I was shocked, upset and appalled. The UKIP Assembly group must surely now have the prize for the most dysfunctional sitting in the Senedd. It is difficult to see what they have achieved other than to squabble amongst themselves. There is an astonishing case of the UK Government wanting to have their cake and eat it in yesterday's Financial Times, who report that David Davis has consulted lawyers over the EU’s preparations for a no-deal Brexit, claiming Brussels’ planning is harming British business and breaching the UK’s rights as a member state. The paper says that in a letter to the Prime Minister, the Brexit secretary pointed to EU “measures” that could jeopardise existing contracts or force British companies to decamp to the continent if the UK leaves the EU without a deal. Mr Davis said in the letter that he would ask the European Commission to revise its guidance to business so it highlights the potential for a future transition and trade deal. It is difficult to know where to start with this letter. If the UK is planning to walk away from EU membership without meeting its legal obligations then why should the Commission and member states play ball in giving us what we want with regards to future trade deals. They are entitled to protect their own position. The EU is not being unreasonable, they are merely outlining the reality for British business if our government abandons their interests and unilaterally walk away from talks. These are truths that UK ministers have refused to acknowledge. As Michel Barnier said in November. “I don’t know if the whole truth has been explained to British businesses on the concrete consequences of Brexit.” He cannot be blamed for doing that job on behalf of the UK Government. David Davis is acting like the playground bully, who suddenly finds himself cornered when his victims gang up against him. He must either negotiate in good faith or walk away and accept the consequences. The UK is being very badly served having a man like this represent our interests in such crucial talks. As if things were not bad enough for business it emerged over the weekend that many companies face further problems when we eventually leave the European Union. Business groups said the change would create severe problems for UK companies, including cash flow issues and additional bureaucracy. At least 130,000 UK firms will be forced to pay upfront import VAT once Britain leaves the single market, under which import tariffs are not imposed on goods bought from other EU countries. Currently, firms can register with HMRC for permission to import some goods from the EU free of VAT. They register the charge but the levy is added to the price of the product and paid by the customer. Under the new system being planned, the Government said, “import VAT is charged on all imports from outside the UK”. Businesses would then have to pay the tax upfront and claim it back at a later date, meaning they would be spending significant sums of money long before they recoup them in sales. Naturally, the British Retail Consortium is livid. They told the paper: “If the bill becomes law without any commitment to inclusion within the EU VAT area, UK businesses will become liable to pay upfront import VAT on goods being imported from the EU-27 for the first time. “Liability for upfront import VAT will create additional cash flow burdens for companies, as well as additional processing time at ports and border entry points attached to the customs process. Mitigation measures could include companies instituting a revolving credit facility, or utilising import VAT deferment reliefs. So much for the Tory party being the party of small business. Sitting firmly in the category of something else the Brexiteers didn't tell us during the referendum campaign, today's Independent headline that more than 2,300 EU academics have resigned from British universities over the past year amid concerns over a “Brexodus” of top talent in higher education is a potential disaster for our higher education sector. [The news] comes after a report from the British Academy warned that the UK’s world-leading university sector could be under threat due to prospective changes to immigration rules after Brexit, with subjects such as modern languages and economics facing the greatest threat. The institution reporting the highest number of resignations was the University of Oxford, which saw 230 departures of EU academics last year compared to 171 in 2014-15, according to freedom of information requests by the Liberal Democrats to 105 universities. The paper adds that King’s College London also lost 139 members of EU staff, compared to 108 before the referendum, while 173 EU academics resigned from the University of Cambridge last year, up from 153 staff the previous year, and 141 in 2014-15. As Liberal Democrat education spokeswoman Layla Moran says “This alarming rise in EU academics leaving our universities is the latest sign of a damaging Brexodus. “Britain’s universities have thrived from having access to talented European researchers, and from years of European cooperation through schemes like Horizon 2020 and Erasmus. “Now all this is being put at risk by this Government’s botched handling of Brexit, where we seem to be losing all the benefits of EU membership while keeping the costs. The week after New Year is always a quiet one news-wise, hence the wall-to-wall coverage given to Parliament’s Environmental Audit Committee proposal to levy a 25p levy on disposable cups and their demand that all paper drink cups should be recycled by 2023 or banned altogether. For many people who enjoy a takeaway coffee on the way to work this may seem a bit over-the-top, but as the Mirror points out, cups used by chains like Starbucks and Costa are hard to process due to the plastic lining, and as only three recycling sites can split out paper and plastic, fewer than 1% are recycled. That means that 2.5 billion of these cups go to landfill each year, an unacceptable burden on our environment, especially when one considers the resources expended to replace them. The introduction of a 5p plastic bag levy, trail-blazed in Wales and copied across the UK, had a massive impact in reducing the use of these carriers. There is no reason why a levy on disposable cups cannot have a similar impact especially when there are alternatives available. It did not take much for people to remember to carry their own bags into shops, surely it is not too onerous a burden to ask that coffee drinkers change their habits too by bringing their own reusable cup. After all the future of the planet is at stake. There has been a visible increase in the number of street homeless right across the UK over the last few years. Even in Wales, where the Government has passed legislation putting the onus on local councils to prevent homelessness, it appears that the system cannot cope with the number and the circumstances of the many individuals presenting themselves as without a home. The reasons for this are many and complex. I do not work on the frontline, nor have I engaged with those who do for a few years now, so I cannot hope to understand them all. Many of those on the streets will have developed mental health issues and/or alcohol and drug addictions that prevent them from living in a more sustainable way. There will also be wider health issues arising from their lifestyle. Research by the NHS has found that the average homeless person has a life expectancy of 47, compared to 77 for the rest of the population, a startling difference of 30 years. The life expectancy for women was even lower, at just 43 years. At present no government is committing enough resources to invest in all those currently living rough, never mind those living on other people's sofas or in temporary accommodation including bed and breakfasts. And in some cases, when a homeless person has a dog for example, they are not always able to find temporary accommodation for them. For that reason, we are seeing more people begging in shop doorways and elsewhere, tents are being pitched on pieces of waste land and individuals are spending longer sleeping outdoors. The appropriate response is to give them practical help and to find ways to get them back on their feet. It is not to treat them like dirt by seeking to sweep them under a proverbial carpet. It is for this reason that I find the actions of a number of local councils to be inexplicable. There is of course the high profile case of the Royal Borough of Windsor and Maidenhead, whose leader has reportedly called for police to take action against rough sleepers in the town ahead of the royal wedding later this year. Even Theresa May has had to speak out against these crass remarks. Police though, say that begging is vastly under-reported, and cite the current restriction of “aggressive begging” as “very difficult to prove”. I am astonished at how these councils are dealing with the problem. It is very uncomfortable to see people less fortunate than ourselves begging on the streets, but we cannot hide away from the problems that have put them in that position. Our attitude to these situations define us as a civilisation. And in some areas we are not doing very well at all in living up to the compassionate and caring standards and values that must underpin any civilised society. Let us offer help, not condemnation, sustenance not prohibition. And if we have to take a selfish attitude to this problem, then consider this: it only takes a small change in our own circumstances to put us on the streets. How would we wish to be treated then? It is a peculiar sensation to find myself half-agreeing with Tony Blair, though one that I only experienced after he left office and started to find some sort of conscience. On Brexit though, the former Prime Minister is spot-on, it will be bad for the country and the Labour Party need to step up to the mark and start to provide an effective opposition. Describing 2018 as “the year when the fate of Brexit and thus of Britain will be decided”, Blair is open about his opposition to leaving the EU and argues that the 2016 referendum cannot be seen as binding as it contained no detail on what a post-Brexit future would involve. Much of the 2,300-word article lambasts the Conservatives’ plans on Brexit as contradictory and confusing, saying it is absurd for ministers to pretend the UK can replicate the benefits of the EU’s single market and customs union while accepting none of the rules. But he ends with a plea to Labour to “be on the high ground of progressive politics, explaining why membership of the European Union is right as a matter of principle, for profound political as well as economic reasons”. Blair argues that Labour’s current ambiguity on the issue is a tactical error as it means the party cannot fully attack Theresa May’s government for neglecting issues such as the NHS and policing amid an all-consuming focus on Brexit. The article criticises the “cake and eat it” phrases of people such as John McDonnell, the shadow chancellor, who has said that although the UK must leave the single market it can remain in “a single market”. “Far better to fight for the right for the country to rethink, demand that we know the full details of the new relationship before we quit the old one, go to the high ground on opposing Brexit and go after the Tories for their failures to tackle the country’s real challenges,” Blair writes. Meanwhile, Corbyn continues to sit on the fence and more and more former Labour members are joining the Liberal Democrats, the only Uk-wide party to have a coherent position on opposing Brexit. For somebody who does not like other country's nationals telling the UK what to do, Nigel Farage is an offensively persistent presence abroad. Whether it is backing Trump's presidential campaign, speaking in favour of the controversial (and losing) Republican Alabama Senate candidate, Roy Moore, or addressing a far right rally in Germany, the seven times Parliamentary loser and three times former UKIP leader just can't keep his nose out of other people's affairs. Now we learn that he is poised to travel to Ireland next month to attend a conference calling for Ireland to leave the European Union. According to the Independent, Farage believes that Ireland should follow Britain’s example and leave the EU because it would benefit the Irish people financially. The paper suggests that in reality, this rather selfish idea has been conjured up by a few hardline Brexiteers, so that they don’t have to compromise on the thorny issue of the Irish border, which they so blissfully ignored during the campaign. Europe has helped Ireland to strengthen its voice on the international stage, and yes, it bailed us out when the banks failed in 2010 – a moment of national shame from which the country swiftly bounced back. A May 2017 poll showed 88 per cent of Irish people think Ireland should remain in the EU, and a further survey in August 2017 showed Ireland was the country most optimistic about the EU’s future, with 77 per cent of people responding favourably. And yet the Facebook page for February’s event warns that “Ireland is at risk of becoming a powerless EU province.” Nothing could be further from the truth. As of 2017, Irish MEP Mairead McGuinness is the Vice President of the European Parliament and last month, the EU gave Ireland the final say on whether or not Brexit negotiations should move on to the next stage. This was not for one upmanship against the British, but because Irish politicians and diplomats had lobbied hard to put the border issue at the top of the agenda, and because other EU leaders appreciate the complex issues which have forged a unique situation on the island of Ireland. This was a display of consensus, respect and solidarity – concepts which may look unfamiliar if your political background is the muddied, chaotic ranks of Ukip. The crucial difference between Ireland and the UK though is that there is no far right party or significant faction within a ruling group who want to leave the EU. Ireland's membership of the EU has transformed its fortunes and nobody there will want to follow the UK into oblivion. Indeed the fact that we have opted for Brexit may well prove an incentive for Ireland to strengthen their links with Europe. One is tempted to ask the Irish to kindly hold onto Farage and not send him back, however I happen to like the Irish and would not wish that on them. Another day, yet another Brexit myth shattered. This time it is the idea that once we leave the EU people are going to be queuing up to sign trade deals with us. The Mirror reports on the fruitless quest of the UK's International Trade Secretary, Liam Fox who, they say has flown around the world eight times trying to line people up to sign on the dotted line. Dr Fox has been to the US four times and to Geneva four times, according to The Times. In his first six months he flew 54,000 miles, including to the Indian cities of Mumbai and Pune. In his second six months, he flew 65,000 miles, including to Hong Kong, Toronto and Manila. And in the last six months he flew 101,000 miles, including to Mexico City, Tokyo and Sydney. It is a high price to pay with so little reward to show for all that effort. I am tired so here is some party political propaganda until tomorrow. Happy New Year everybody.